anakpanyu......slowly walking towards the finish line: What is next? It’s been 3 weeks after my first half Ironman and I’m thinking of doing Ironman. A few hours after finishing AVIVA 70.3 Ironman, I felt that I’m not ready for the full Ironman yet considering my swimming result was not that good. Ironman swim is 3.8km which is double the distance of 1.9km. I won’t be able to finish in time (for everyone info, my swim time for 1.9km was 1:09:40, 20 seconds to cut-off time. 1. Ahmad Fathi, Hamsul, Sharif and JJ have registered for Ironman New Zealand 2012. Ada macam rasa ketinggalan because everyone is doing it. If it is just one person doing it, it doesn’t affect me that much. 2. This year Ironman events (nearest to Brunei), most of it are already sold out, so the only option is next year, but I have to register this year to do the event next year. Ironman event, once the registration is open, it can be over within 4 hours. SOLD OUT !!! 1000 entry within 4 hours. 3. The original plan was to do Ironman Langkawi this year but due to the event organizer has some unresolved issues, so no event lah. 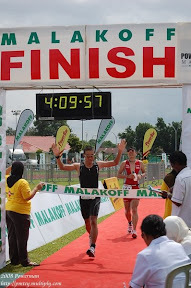 Next year Ironman Langkawi is still unconfirmed. So other alternative, look somewhere a bit further but not that too far such as Australia, New Zealand, Korea, China, Japan or Taiwan. 4. The missus have issued a warning to reduce my international events.So have to reduce lah. Ironman event is a must TO-DO-EVENT before 2013. Unless the event is during school holidays, then it is exceptional. 2013 will be the year my son start his school, so I have to reduce the number of overseas events i.e. no more event during school days, travelling more than 1 day and ……. So the plan is, register as soon as the event is open for registration. Most probably IM Australia or IM Korea. Then baru fikirkan to do or not to do. Other issues would be MONEY$$$$. Its going to be an expensive event. Most probably I would need around $5K for everything – registration, air tickets, accommodation, transportation, food & drinks, assistant crew and etc………….nda cukup usulnya $5K. Where to find ????? The sport of triathlon, if No EXTRA money, don’t do it. GO and DO other sports such as running………….